Little Lake Fire Chief Jeff Smith retires on March 31, following a distinguished 22 years of leadership within the community. The city of Willits issued a proclamation Wednesday recognizing Smith for his heroism in the face of danger and his devoted service to the community. "As fire chief and fire marshal, Chief Smith is probably the closest thing to a celebrity Willits has. He is a kind and generous person, everyone knows him, even out of uniform, so he cannot go anywhere without people wanting to stop him and talk or ask him a question about something," says a Little Lake Fire Association spokesman. "We have all seen Chief Smith on the fire scene; a factory leveled by flames, tanker trucks on fire, burning buildings falling on firefighters, the blood, gore and screams of the most horrific accidents. "Chief Smith possesses the rarest of leadership traits, the more intense the situation, the calmer Jeff becomes. Chief Smith is also known for his compassion; comforting families who has lost everything they owned in a fire. "Chief Smith understood each of us, probably better than we understood ourselves. He knew when to pat you on the back, or give you a swift kick in the behind. Chief Smith was not afraid to voice his displeasure at the occasional screw-up if it was appropriate, and the offender seldom made that mistake again. 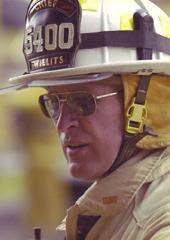 "As firefighters, we will all try to remember the things that Jeff taught us, all the little things, putting up ladders, hose-company drills, fighting fire aggressively. But, more importantly, Chief Smith imparted some elements of his leadership skills in all of our lives, from chiefs, captains, engineers and firefighters, whether at home with the kids, in the workplace, or on the fire scene," says a LLF spokesman. Smith was born and raised in Willits, graduating from Willits High School. He and his wife Jann have been married for thirty years. Jann stayed at home to raise their two sons when they were young and now works as an office assistant with CalFire. Their oldest son Shawn spent seven years in the military, including two tours of duty in Iraq and now works for Gulfstream in Savannah, Georgia. Chad is a firefighter with CalFire and volunteers with the Brooktrails Fire Department. "Those inside the fire service know Smith contributed so much more to the community. Unless you have been in the volunteer fire service environment, you have no idea how much time and commitment is given by the firefighters and their families. With his dedication and leadership, Smith set the highest standard for expectations that became the guide for the entire department," says a LLF spokesman. Monday, March 31 will be Smith's last day as fire chief, with the new Fire Chief Shane Burke stepping forward to fill some very big shoes the next day. "[We] commend and honor Jeff Smith for his years of extraordinary, selfless contributions to his profession and our community, and to express the city's heartfelt appreciation for his dedication and commitment to the citizens of Willits," as stated in the proclamation adopted unanimously by the Willits City Council on March 26.